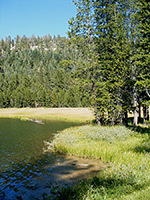 Lukens is one of Yosemite National Park's less scenic lakes, surrounded by thick fir and pine forest in an area of gently sloping hills and glacial moraines, lacking the dramatic mountainous setting of the High Sierra country further east - the lake is situated close to the Tioga Road towards the west edge of the park, at an elevation of 8,230 feet. Instead, the main attractions of the hike are the floral meadows around the water's edge, and the deep, dark forest en route, good habitat for bears and various smaller mammals, while the lake itself is used for swimming and fishing (several species of trout live here). Lukens Lake may be reached either from the highway (0.9 miles) or the White Wolf Campground (2.3 miles), via trails that have only slight elevation change and are moderately popular, especially with people staying at the campsite. One minor irritation of the hike is the presence of mosquitoes, usually quite abundant in summer owing to the cool, moist environment. The southern trailhead has an ample parking area at a pullout along the Tioga Road, a location that is also the start point for a lesser used path heading south towards Yosemite Creek. The Lukens Lake Trail climbs slowly through well established forest of particularly tall, thick trees, though many of the largest specimens have been severely burnt in a wildfire. 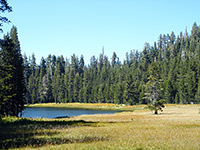 The path reaches a low saddle then descends through undamaged woodland to the edge of the lake, which is bordered on the east side by a sizeable area of tall grass marsh, sprinkled with wildflowers in early summer. The route originally crossed the meadow and ran along the north shore of the lake, but this has been changed fairly recently because of damage to the meadow - the deepening path was affecting drainage and harming the plants. 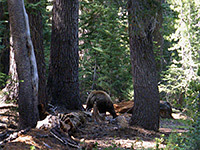 Now the trail takes a slightly longer course around the south and west shores, before crossing the small outlet stream and re-entering the thick forest, descending fairly steeply by 200 feet towards the larger drainage of the Middle Tuolumne River, which is then followed for 1.5 miles to the White Wolf campground, passing smaller meadows and a few tiny streams. There are two junctions on the way, with longer trails to the Ten Lakes and the Grand Canyon of the Tuolumne.